Start with 13 dots in the center and stop at 7 by putting interlaced dots at both sides as shown above. Join dots as shown in the above picture. Put extra loops and lines in the flowers as shown above. Fill with desired colour powders. You have an excellent collection of kolams. It is to be treasured for times to come, so that people have a good idea about the kolams and will also practice it. I am impressed with the variety of kolams you know and marvel at the way you have excelled in this art. All the best. Thank you very much for visiting my site and your encouraging comments. Thank you for visiting my site. If you put the dots correctly (giving equal space between dots), then the kolam will be perfect. Thank you for visiting my site. Nice to hear that you are trying the kolams and they came out well. Thanks for all your bunch of kolams.good work. Thank you for visiting my site. Great to know that you are putting this kolam. It will look really good on the floor with real colour powders than in the above picture. All the best. 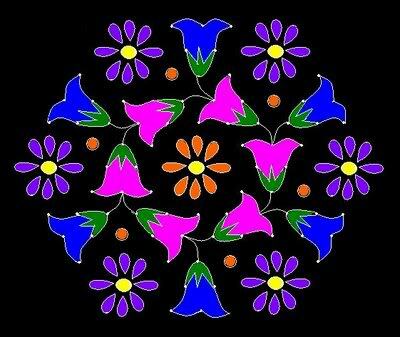 Try my other flower kolams. Will post more soon. Thank you for visiting my site. Will post more rangolies. Congratulations on winning Kolam competition. It is really nice to note that my kolams are somehow useful to others. If you have photo of the kolam drawn by you, please send it to my mail id: kamalascorner@gmail.com, so that I can publish the same too in my blog with due credit to you. Hi Kamala mam, Very nice.. Gr8 effort put on by you.. Simply superb.. Thanks a lot!!! hi kamala mam ,great thanks for u.very nice kolams ,splendid thanks a lot!!!!!! Thank you Nikki for your kind comments.